Look out for added sugars in packaged varieties and avoid those. 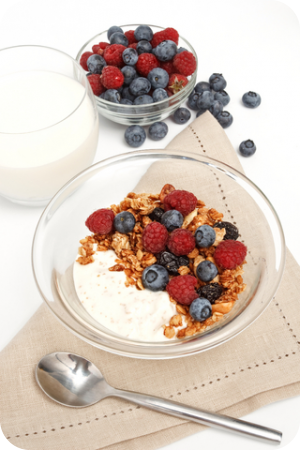 Often, shop-bought muesli tends to be rather chewy and tasteless or a total sugar-shock! If you really don’t want to make up your own, then look for an organic muesli with a long shelf-life (the use-by-date is months away), and make sure you can pronounce all the items in the ingredients list! Choose organic varieties where possible to maximise the nutritional benefit and reduce exposure to toxins. Top it with chopped fresh fruit just before you are going to eat it (apple, or banana, or blueberries, or raspberries or a mixture of these).